Are you following Premier Guitar on Twitter? Besides being a great magazine and a huge supporter of I Heart Guitar, Premier Guitar rocks because they’re posting some incredible photos from Summer NAMM, including this awesome Randall Nuno Bettencourt signature NB112 combo, a speaker-totin’ version of Nuno’s NB100 amp head. Designed with Nuno Bettencourt and partner Peter King, the new NBKing100 is the perfect combination of classic regal looks and modern circuitry to reproduce the legendary percussive tone of Nuno Bettencourt. A classic 2-channel amp with 3 modes of operation, you can instantly select via the MIDI channel switching, a sparkling CLEAN channel with the perfect amount of drive, an OVERDRIVE for any vintage to modern high gain rhythm tones and a SOLO mode for unparalleled harmonic sustain. The rear panel features include MIDI in/thru, Power tube bias section and Series Effect loop. CLICK HERE to buy the Randall Nuno Bettencourt NBKing100 100W Tube Guitar Amp Head from Musician’s Friend. 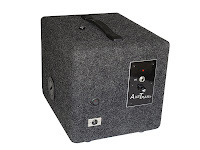 CLICK HERE to buy the Randall Nuno Bettencourt NB412 100W 4×12 Guitar Speaker Cabinet from Musician’s Friend. CLICK HERE to follow Premier Guitar on Twitter. The Jackson Mark Morton Dominion is, obviously, the signature model for the Lamb of God guitarist, but even players who aren’t into LOG can still find a lot to like about the Dominion. Well now players on a budget doesn’t have to squirrell away their bucks for quite as long with the introduction of the D2 Dominion, a lower-priced, stripped down version with Duncan Designed pickups. CLICK HERE to see my review of the original Dominion. Jackson’s Mark Morton Dominion™ signature model is now available in an even more affordable version, the D2. Available in two finishes—black or an eye-catching trans-black on a quilt maple veneer top—the Mark Morton Signature D2 Dominion boasts a bolt-on maple neck with a compound radius (12”-16”) rosewood fingerboard, dot inlays and a 24.75” scale length. Loaded with a pair of Duncan Design™ HB-101 humbucking pickups, each with individual volume and tone controls for maximum sonic flexibility, the guitar also features an adjustable chrome bridge, a stop tailpiece and the Lamb of God guitarist’s signature on the truss rod cover. Jackson is proud to announce the addition of three splendid new Pro Series models to the Bloodline—the SL3MG Soloist™, KV5FR King V™ and KE5FR Kelly™. All are equipped with a Floyd Rose® FRT-O2000 double-locking two-point tremolo. 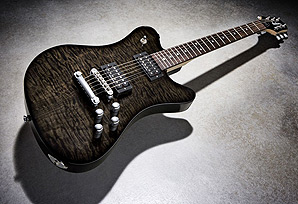 The SL3MG Soloist is an upgraded version of the venerable SL3, with an alder body in several finishes (flame maple veneer on trans finishes), rock maple through-body neck, 24-fret compound radius rosewood fingerboard, active EMG 81 (bridge) and 85 (neck) humbucking pickups and black hardware. The KV5FR King V is a menacing new take on Jackson’s classic King V, with an alder body available in Black, Bolted Steel and Snow White with black bevels. It too has a rock maple through-body neck, 24-fret compound radius rosewood fingerboard and black hardware, plus Seymour Duncan® JB™ (bridge) and Jazz™ (neck) humbucking pickups. The KE5FR Kelly presents the latest version of one of Jackson’s most distinctive body shapes. Like its King V sibling, it boasts an alder body (this time in Black, Black with gold pinstripes and Snow White with black bevels), rock maple neck-through-body, 24-fret compound-radius rosewood fingerboard, black hardware and Seymour Duncan® JB™ (bridge) and Jazz™ (neck) humbucking pickups. Like all Pro Series instruments, the SL3MG, KV5FR and KE5FR come with a Jackson molded hardshell case. And while this Sham Kamikaze Stratocaster is a Malaysia-only model, I certainly wouldn’t be surprised to see a few filter through to the west through import channels. I imagine this guitar being very popular with fans of a certain Mr. J Hendrix. Available only in Malaysia; distributed by Bentley Music. Here’s the line-up of new guitars from Ibanez at Summer NAMM. A lot of these have been available in other markets, and most amount to new colours for existing models, but people are always asking for more Ibanez colour options so that’s a good thing! CLICK HERE to see Eastwood guitars at Fat Tone Guitars. Eastwood Guitars adds two new models to their popular Airline ’59 Custom Series, the Town & Country ’59 Custom STD and DLX. These retro-beauties will be making heads turn in concert halls and bars around the world. Guitar legend Chris Spedding sums up the Town & Country models best, “my Airline plays so sweet and looks so cool, I had to change my wardrobe to match it”. The Airline Town & Country ’59 Custom guitars feature a unique black rubber binding surrounding the entire Vintage Cream body, which replicates the esthetics of the original Airline Res-O-Glas guitars. The cosmetic details on the STD include a retro-striped pickguard and control guard with vintage style chrome hardware and the DLX model comes with a BIGSBY licensed tremolo. This 25 ½” scale guitar is a players’ dream with a fast maple neck, rosewood fingerboard and block markers bolted onto a tone chambered mahogany body. These guitars deliver unlimited tone possibilities with high output Airline Vintage Voiced Single Coil pickups, a 3-way switch, master volume, and individual volume and tone for each pickup. The Airline ’59 Custom guitars ship in the new Vintage Style Deluxe form-fit AIRLINE hardshell case with steel plate logo. Stuff like that happens, right? When the world’s economy enters a steep decline your tone shouldn’t also. Elite Tone has stepped up to the plate a offer the working music a new line of affordable handcrafted effects without cutting corners. Kicking off this new line of effects all under one hundred dollars is the Smooth Boost.